Starz, the premium cable channel that offers movies and original series, now works with Spotify, the premium streaming music service. Which is... odd. An updated version of the Starz Android app now includes integrated streaming tracks from Spotify, all of which are either original music or soundtrack selections from those Starz series and movies. Apparently there are "more than 3,500" selections that are at least tangentially related to the Starz catalog. The strange thing is, listening to the full versions of these tracks still requires a Spotify Premium account - free users can only listen to 30-second previews. And that's on top of requiring a separate Starz subscription to get into the app. At least some of this music is already on the public version of Spotify, which grants free access on the web. So for example, anyone can listen to the Outlander soundtrack on the web without paying a dime, but to listen to it in Spotify, inside the Starz app, you need two separate subscriptions from two companies. The whole partnership seems like an ill-advised bit of cross-promotion. I can't think that anyone would want to listen to Spotify tracks in a dedicated video app, especially since they're presumably paying for the Spotify app that's already on their phone, where all that music can already be found. The Starz app doesn't even play music well - there's no notification for ongoing music, and no way to control it aside from directly in the app. Other improvements in the latest version of the Starz app include "improved cast & crew pages with artist bios," and bug fixes for Chromecast and other behind-the-scenes functions. BEVERLY HILLS, Calif.--(BUSINESS WIRE)--Starz and Spotify, the leading music streaming service, announced plans to launch the first-ever streaming music integration into the STARZ premium video streaming service app. Starz launched an upgraded version of its free STARZ app that immerses the Spotify music experience into its premium video experience for STARZ Original series and other STARZ premium movie and television content. STARZ app subscribers will have access to a wide range of songs and soundtracks from hit TV shows including “Power” which features music from executive producer Curtis “50 Cent” Jackson, “Outlander” from Emmy®-winning composer Bear McCreary (“The Walking Dead,” “Battlestar Galactica”) and movies from the largest premium pay TV movie library, including Star Wars: The Force Awakens, Annie and Disney’s Inside Out. Spotify Premium users will be able to login and listen to full tracks while Free users can listen to 30-second track previews. 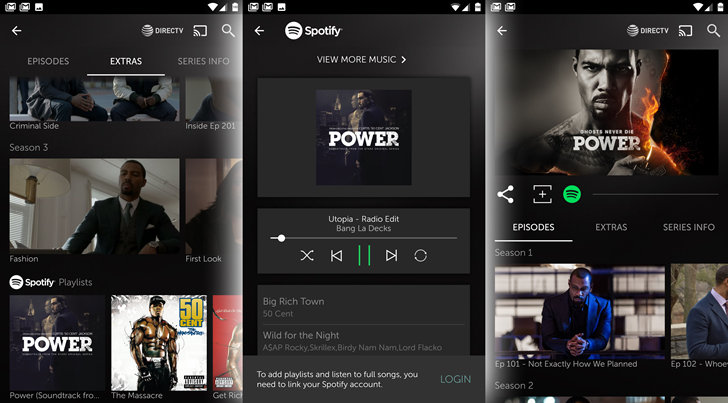 All users can also save and follow Spotify playlists from within the Starz app. Customized STARZ video recommendations will also be provided to Spotify users on the STARZ app based on their Spotify listening habits, exposing them to the depth and breadth of the STARZ library and bridging the gap between the entertainment genres. The STARZ App is a single destination for all subscribers who want to stream or download STARZ premium content. Its intuitive content discovery design and navigation offers ease of use and a compelling user experience, regardless of how the consumer purchased a subscription to STARZ. Subscribers to the STARZ sister networks, STARZ ENCORE and MOVIEPLEX, also use this single destination app for access to stream. For $8.99 per month with a 7-day free trial for new subscribers, fans now have the opportunity to enjoy instant access to more than 3,500 selections each month, including STARZ hit series ranging from “Outlander,” “Power” and the upcoming “American Gods” and other TV content, to Hollywood hits and popular movies including Star Wars: The Force Awakens andAvengers: Age of Ultron.